In 2016, there were 6939 road traffic crashes in Georgia. 9951 people were injured and 581 lost their lives. Among them, 17 children were killed, and 1019 had serious injuries. One of the main reasons for this high toll, particularly on children, is a gap in Georgia’s seat belt legislation, where there are specific shortcomings with regards to children’s safety. New amendments introduced in July 2017 stipulated the mandatory use of seat belts, BUT did not include the mandatory use of child restraints. This means that in effect anyone over the age of 16 sitting with a child on their lap is complying with the law if they are buckled up with a seat belt and very few people actually use child car seats or other restraints. This situation is putting all children travelling by car in Georgia at serious risk. Our EASST partners, Partnership for Road Safety, are partnering with FIA members the Georgian Automobile Sport Federation, to promote the use of child restraint systems in Georgia and advocate for legislation changes to make their use mandatory. The project will include a baseline survey to better understand the particular messages and action needed to increase child restraint use in Georgia, followed by a national media campaign to raise awareness and present the issue in a public space. Building on this momentum, the project will then lobby for further amendments to Georgia’s seat belt legislation to include provisions for children and ensure the law’s enforcement. Like in other EASST countries, the cost of car seats can be an inhibiting factor to their widespread use. 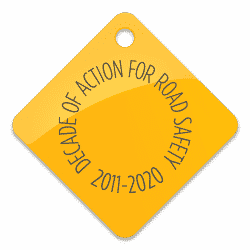 To solve this the Partnership for Road Safety and Georgian Automobile Sport Federation will seek to set up a seat-belt recycling and distribution scheme. This will involve people donating child car seats that they no longer need (which are checked for safety) and redistributing them to families most in need for free. In terms of child safety in cars, Georgia currently falls under Level 3 of the Federation Internationale de l’Automobile (FIA)’s Toolkit for Child Safety in Cars in that there is a child restraint law in place but low usage. By addressing this serious gap in legislation and safety practices, this project has the potential to significantly cut the risk posed to children’s lives while driving in Georgia.